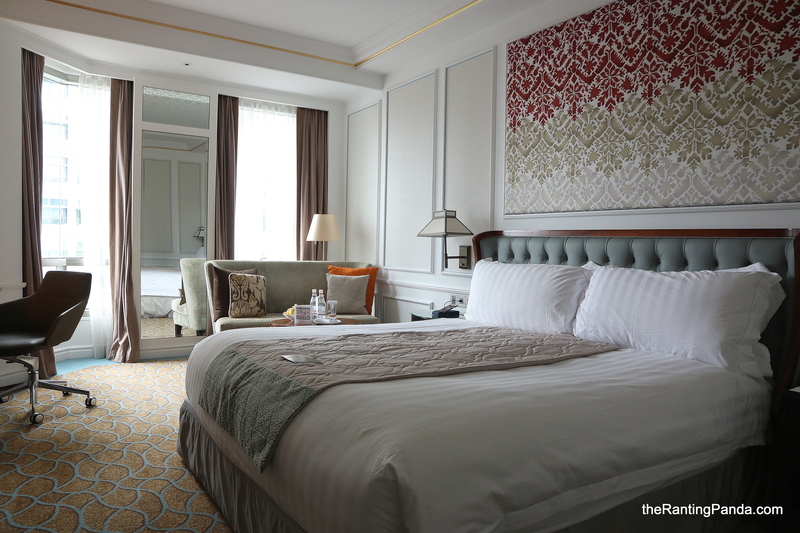 The Hotel The Peranakan-themed InterContinental Singapore hotel in Bugis has been a mainstay of the district’s rapid development in the last decade. Constantly raved amongst the top hotels in Singapore, this is an ideal property for staycation with Bugis Junction and the Bugis MRT Station linked to the hotel. All these on top of what the property has to offer, a heritage, a food haven (yes, the Pandas always fancy a meal at Man Fu Yuan), and it is afterall an Intercontinental property. The Room Checked into the Club Deluxe Room, which occupies one of the top levels of the building. The 38sqm room has partial views of the city skyline, although you might not want to open the curtains too wide since the National Library sits just opposite of the hotel. Taking on inspirations from the Peranakan culture, the lighter colour tones of the room makes it up for the minimal natural lighting in the room. The toilets has been revamped, and spots a modern look with a smart use of white tiles and black frames, giving it a contemporary look. The Facilities The Fitness Centre opens throughout the night, one of the perks of staying here. With the whole space looking relatively new, the fitness centre has some of the newest equipment, including a quiet yoga room at the corner for the yogis. One level up from the fitness centre, while the swimming pool gives a view of the city skyline while you sunbath, the facility does look in need of an update. Located at level two of the property, we must have spent too much time here during our stay – the Club InterContinental Lounge. With all-day coffee and tea, with an afternoon tea set during mid-afternoon, and free-flow cocktails and hors d’oeuvres during the evening, there is very little reason for you to even step out of the lounge. The afternoon tea set is a simplified version of the usual tea set at The Lobby Lounge, with a selection of the usual sandwich and scone, and a local peranakan kueh completing the set. For the evening spread, while the cocktail list and house-pours selections made the evening an enjoyable one, the food options could have been more varied. For guests with club rooms, go for the guided heritage walking trail in the Bugis precinct available every Saturday. Or bring along two shirts for pressing, these are just fringe benefits for checking into one of the club rooms. The Restaurants This is perhaps one reason why I have been heading back to InterContinental Singapore, the food concepts at the hotel have always been amongst the best in the town. From the impressive Cantonese restaurant Man Fu Yuan helmed by local celebrity chef Eric Neo, to the all-day dining European concept Ash & Elm to the hotel’s peranakan-inspired salon The Lobby Lounge helmed by one of Panda’s favourite pastry chef Ben Goh. After checking out, we do recommend you to “extend” your stay at the property whilst going for the afternoon tea at The Lobby Lounge. Usually at S$78++ for 2 pax, get a choice of two drinks while enjoying a selection of both savoury and sweet high tea snacks. Rants Up the ante for the food quality at the Club Lounge. Overall Experience With an impeccable service, my stay at InterContinental Singapore is an oasis in the city. There’s really no reason to head out of the property, except that we sneaked out to Bugis Junction for a short walk since we are in the vicinity, only to return shortly to escape the crowd. And yes, we strolled back into the Club Intercontinental Lounge immediately to sip on a free-flow pot of TWG Chamomile Tea to calm the soul. For more information, check out the InterContinental Singapore Website.